One of our first projects was wrapping paper. We have a big roll of paper from Ikea that we then stamped. Must remember the Ikea paper is not sticky tape nor corner of present friendly!! 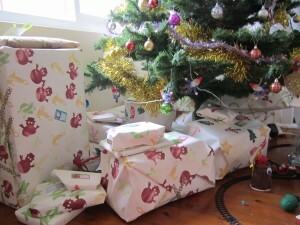 But the result is a whole lot of presents under the tree wrapped in lovingly made paper. We also had a day of quilling where the girls made (well, Amy did but Sophie was tired and lost interest) cards for their special friends. Unfortunately I forgot to take a photo of Amy’s finished work for her album but they turned out really well. She did the whole design herself. I also class cooking as craft, particularly at Christmas when so much is needed! So we have also made 3 puddings and pudding cupcakes, shortbread, chocolate crackles, rocky road and white Christmas. None of my versions of the crackles, rocky road or white Christmas follow the traditional recipes and the additions tend to vary a bit but I think I have finally settled on what will become standard. The chocolate things and puddings will be eaten on Christmas Day (taste testing was, of course, done!) and the shortbread only lasted one afternoon! 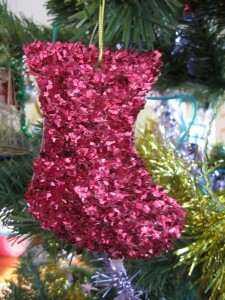 But what I have really wanted to do involved lots of glitter and sequins! 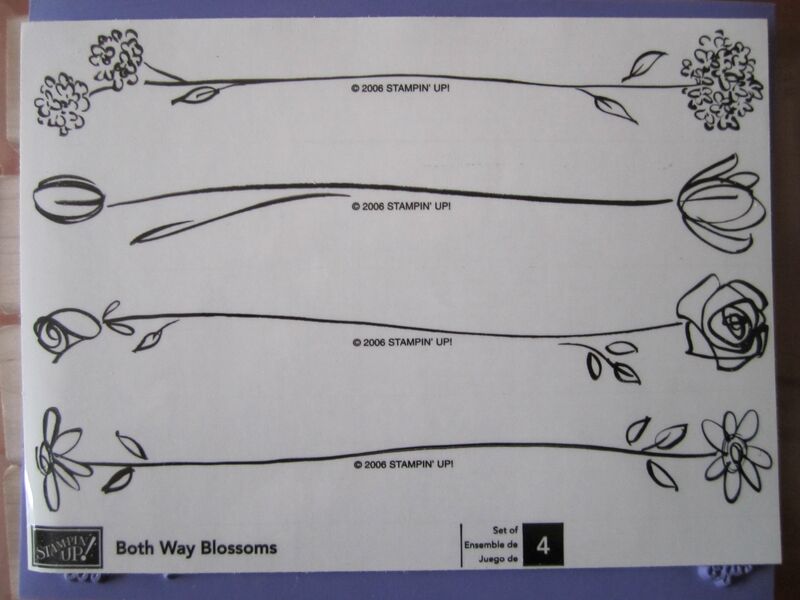 These were going to be the craft kits I was intending on selling. (Due to not very nice insurance companies, however, these won’t be going ahead. Hmm, I still have a couple of kilos of sequins and glitter! ) Our hallway is now glittered and not really sure how well the vacuum works on fine glitter! Hallway? Yes, it was the only space clear enough! I was really stumped for presents for the girls’ teachers and Sophie’s speech therapist this year. I didn’t want to go in for a voucher (too impersonal), and wasn’t really keen on buying just anything. They were important milestones we were thanking the teachers for this year; Amy had really enjoyed her year and having an “arty” teacher had really kept her happy, Sophie was finishing preschool and both girls had had the same teacher so she had been part of our lives for 4 years and had really made an effort to help Sophie with her speech and language issues and Sophie was finally finishing up with her speech therapy after 2 and a half years. What to give these special people? Another friend makes an embroidered ornament for the teachers which I thought was a lovely idea but I’d never thought of giving something like that. It was when I was in the local art and craft shop (the girls there are starting to recognise me now – oops!) 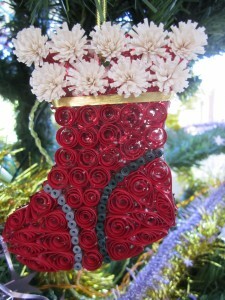 that I saw some glass ornament and they were just calling to me to put some quilling on them. Present idea decided! 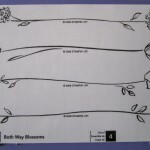 Now to design and make 4 of them (one for us to keep of course!) in 2 weeks! I decided to quill one side and and cover the other side in glitter – can’t have too much sparkle at Christmas!! Once I’d worked out the design, the sizes of shapes etc, it was time to get them all done. Oh no! Not enough paper!! So a quick call to a supplier and my Mum to pick up the order, and I was on my way. Luckily I now have my new glasses because I was working for hours into the nights. I was certainly not counting on the humidity! Humidity certainly effects the coiling and sticking of paper. 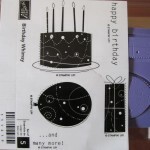 Because I was working with metallic paper too, it got quite tricky at times! 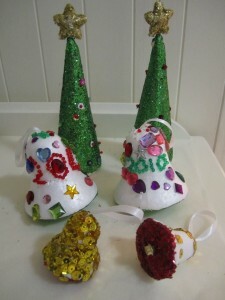 The designs on each varied a little with each ornament which I didn’t mind as it made each one unique. 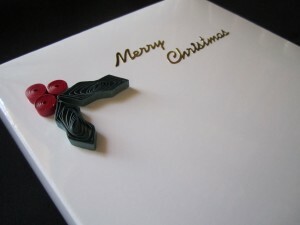 I then put them in a pretty white box with quilled holly on it. I am really happy with the result. It was nice to give a personal gift to those making a big difference in our girls’ lives. I’ll start earlier next year though! Ok, the time has come to really be sensible about what craft things I stash! The excess is stifling my creativity !! 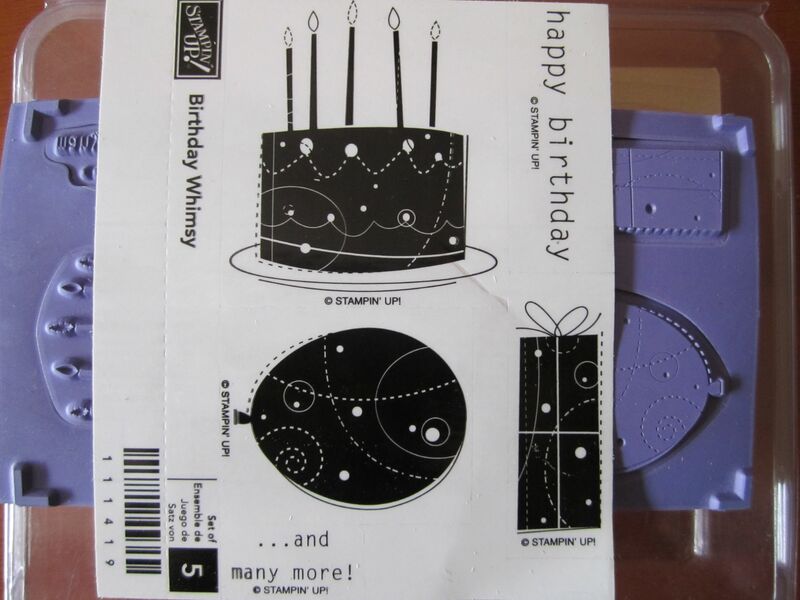 It is time to de-stash some of my rubber stamps – all Stampin Up! brand – that I have bought with all sorts of great intentions and ideas but have either never used or maybe used once before having great intentions and ideas for another set! I will be listing them with a photo and price on my Facebook page under the Photos tag. At this stage, I can only offer them to Australian residents who can pay by direct deposit. If you would like more than one set, I will try to combine them in one parcel and let you know the final price. Please feel free to ask about any of the stamps. If you don’t have access to Facebook and you are interested in any stamps, please let me know and I will see what I can do for you.